Kimball Farm in Haverhill, Massachusetts is a real working farm that has a small visitors’ attraction and a corn maze. Uniquely, their corn maze is planted on a hillside, so that you can see most of it from the ground! The attraction has almost no visitor infrastructure, but that’s better than for it to be heavily commercialized. 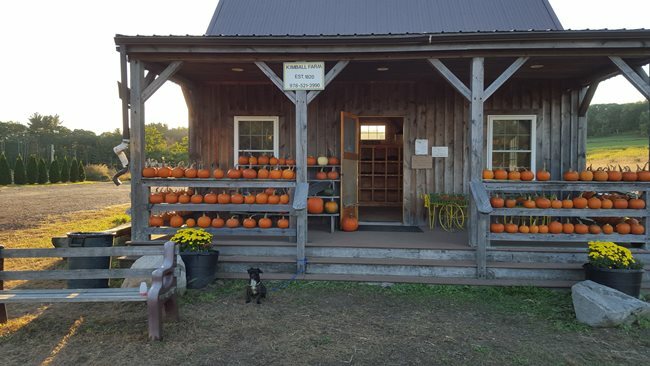 You’ll find a small farm store with drinks, apples, pumpkins, butternut squash, cookies on a stick, candy, and more. You can get a professional photo taken, pet a miniature horse and two goats, or play in a “sandbox” filled with corn kernels. 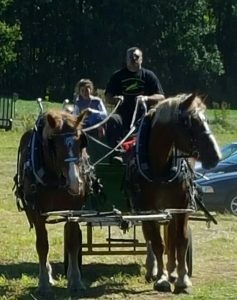 You can go for a horse-drawn hay ride or a “sunflower” ride up to the sunflower fields. That is sensational. (And in the winter, they offer sleigh rides.) There’s also a huge slide made from a giant black plastic tube of the type used for drainage. Entering the corn maze costs only $10, a good value. The entrance to the corn field is planted with sunflowers; it’s beautiful and peaceful. Wear boots if it’s rained recently, because the paths may be muddy. The paths are wide enough for visitors to pass each other in opposite directions, and we did see a little trash and a few fallen corn stalks in the pathways. 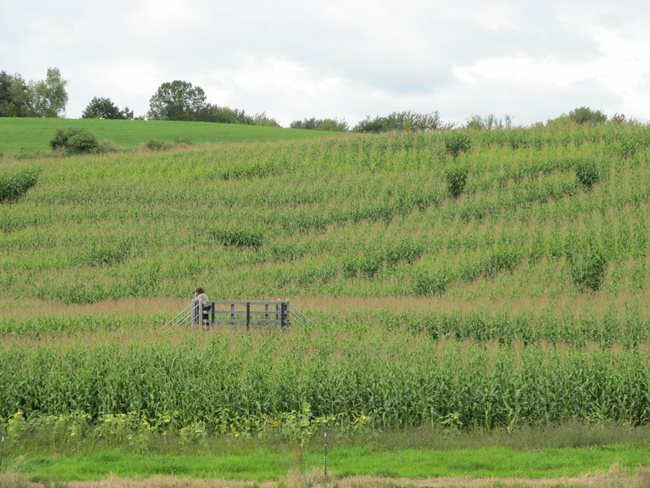 With most corn mazes, you need to look at aerial photos to get the big picture, but at Kimball Farms, because the maze is on a hillside, you can see much of it from the base of the hill. When you’re inside the maze and reach a clearing, you can also see out from the hill to great views of the farm and surrounding countryside. The maze is not complicated — we walked the first 5 minutes of the path without hitting any branches — and there are no dioramas or games in the maze except for some numbered posts. On the day that I visited, Kimball Farm hosted the 5K Foam Fest, by 365 Sports, which has been flagged with complaints through the Better Business Bureau. I was suspicious of the price, $60 + $10 for parking (compare this to $70 for everything you get at Six Flags New England), which wasn’t a good value for what amounted to an outdoor foot race with perhaps 20 inflatable obstacles. The website says, “Plus let’s not forget about charity, were raising money for that!”, but staff on site could not tell me what charity the money from the festival went to. (You could bring food to give away at the festival, though.) They played rock music. There’s foam. You run through open farm fields and can jump off of a 20-foot leap onto a cushion and slide down a giant inflatable slide. So 2.5 stars for the 5K Foam Fun Run, but Kimball Farm’s main visitor attraction though small was solid, and we enjoyed the corn maze. 4 stars. See kimballfarmhaverhill.net.